There is some question as to whether this photo is actually Ann Mitchel or Julia Francis Etheridge. However after studding later photos of Julia Francis Etheridge, and not finding matching facial features, I believe it is most likely Ann. It was found in a dilapidated storage shed on the Drivers Virginia homestead of Charles Edward Harrell (her 5th child) in 1997 by Charles Thomas Harrell. Attached to the frame was the word Mother. She is listed at Ann Marina Mitchell on son Walter's Social Security Application in 1952. 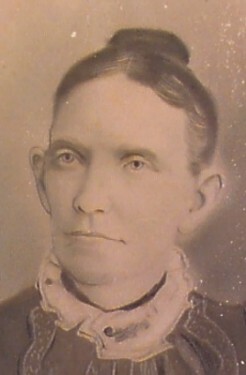 She is also listed on 1850 Gates Co. Census as Ann M. Mitchel page 32, aged 7 and on 1860 Gates Co. Census as A. M. Mitchel as aged 17, page 101 (201), Holly District. Buried Near Wilroy, Suffolk Va.